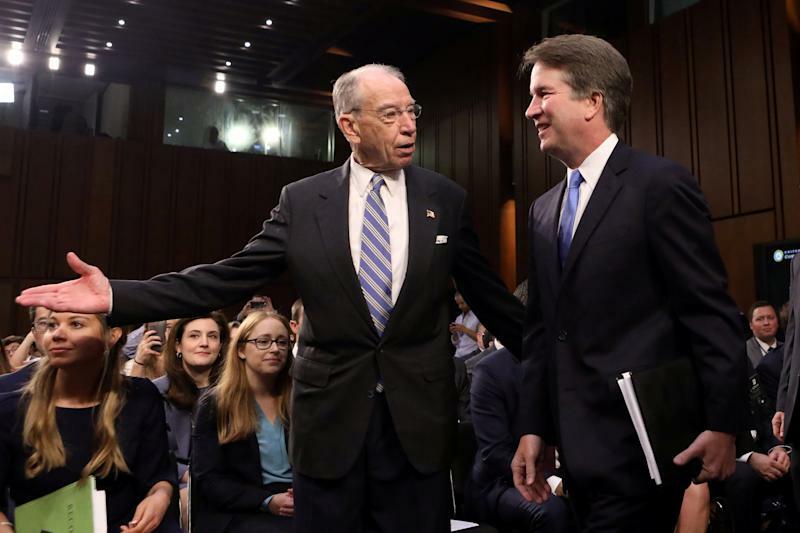 WASHINGTON (Reuters) - U.S. Senate Judiciary Committee Chairman Chuck Grassley set a Saturday afternoon deadline for a woman accusing Supreme Court nominee Brett Kavanaugh of sexual assault to decide if and how she will testify, the New York Times reported. The Committee had delayed a vote on Kavanaugh's confirmation after California professor Christine Blasey Ford's allegations emerged last week, and her lawyers and committee staff were negotiating the conditions of her testimony. Grassley gave Ford's attorneys until 2:30 p.m. EST to negotiate the terms of her testimony to the committee next week, the Times reported, citing an email he sent to her lawyers. Earlier in the night, Grassley said on Twitter that he had granted an extension to Ford after a 10 p.m. (0200 GMT Saturday) deadline he set to reach a deal with Ford's lawyers had passed. "Judge Kavanaugh I just granted another extension to Dr. Ford to decide if she wants to proceed (with) the statement she made last week to testify to the Senate," Grassley wrote on Twitter. "She should decide so we can move on. I want to hear her. I hope you understand. It’s not my normal approach to be indecisive." Grassley had said earlier that the panel would hold a vote on Kavanaugh's confirmation on Monday unless a deal was reached with Ford's lawyers by Friday night's deadline. In an email to judiciary committee staff, Ford's lawyer Debra Katz called the deadline "aggressive and artificial." Kavanaugh has denied the allegation and pledged to testify at Monday's hearing. The Republican-controlled Senate judiciary panel has struggled on how to proceed with Kavanaugh's nomination. Democrats have demanded more time for scrutiny, and Republicans want to move ahead quickly with a confirmation vote in an increasingly volatile political climate ahead of congressional elections on Nov. 6. "Judge Brett Kavanaugh is a fine man, with an impeccable reputation, who is under assault by radical left wing politicians who don’t want to know the answers, they just want to destroy and delay," Trump wrote. Trump's Friday tweets contrasted with comments earlier in the week when he said Ford should be heard, even if it meant a delay in the confirmation process. Senator Susan Collins, a moderate Republican and potentially a key vote on Kavanaugh's nomination, said at an event in Portland, Maine, that she was "appalled" by Trump's tweet. "We know allegations of sexual assault are one of the most unreported crimes that exist," Collins said, according to the Portland Press Herald. "So I thought that the president’s tweet was completely inappropriate and wrong." If the hearing proceeds, Republicans will be forced to walk a careful line in questioning Ford's account without alienating women voters ahead of the elections. Before the 2016 presidential election, more than a dozen women accused Trump of making unwanted advances. Democratic Senator Kirsten Gillibrand called Friday's comments a "vile attack." "The most powerful man in the world just used his position and platform to attack a sexual assault survivor," she said on Twitter. "This is the same man who has been credibly accused of more than a dozen cases of sexual assault or harassment." The Senate Judiciary Committee released a letter it sent to Ford's attorneys earlier on Friday in which it accepted some of their demands, including that Kavanaugh not be in the room when she testifies. "We reserve the option to have female staff attorneys, who are sensitive to the particulars of Dr. Ford’s allegations and are experienced investigators, question both witnesses," the letter said. "You watched the fight, you watched the tactics, but here is what I want to tell you - in the very near future, Judge Kavanaugh will be on the United States Supreme Court," McConnell told the Value Voters Summit, drawing a standing ovation. McConnell's goal has been to confirm Kavanaugh by Oct. 1, the start of the Supreme Court term. Ford's team has sought guarantees of her safety because of death threats. Kavanaugh and his wife also had received threats, a senior White House official said.